STORMWATCH #0,1-5 (1993) IMAGE COMICS 1ST APPEARANCE STORMWATCH! 1ST BACKLASH! Stormwatch #1,2,3,11 & 0!! Vol.1,1993, Image comics, 5 total comics...Nice lot!! Stormwatch#5 Incredible Condition 9.0(1993) Brett Booth Art!! 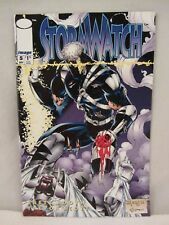 Stormwatch #0-5 (Mar 1993, Image) 1st App: Stormwatch, Jim Lee Art! This page was last updated: 23-Apr 22:04. Number of bids and bid amounts may be slightly out of date. See each listing for international shipping options and costs.